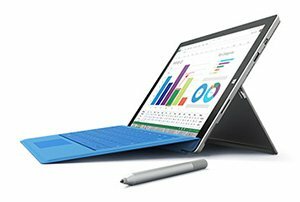 The new Surface Pro 3 is in a category of its own. 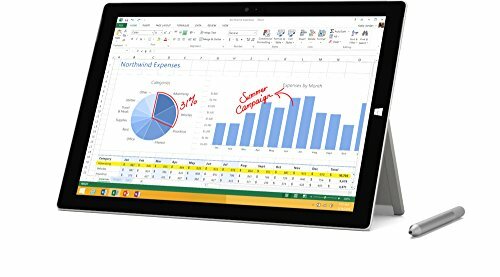 With a stunning 12″ display in a sleek magnesium frame, Surface Pro 3 has all the power and performance of a laptop in an incredibly lightweight, versatile form. It may just be the ultimate device. 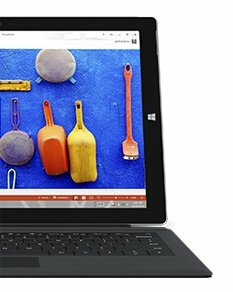 Surface Pro 3 is the thinnest and lightest in our Pro family with a 12″ laptop-sized screen for ultimate productivity. The 4th generation Intel Core Processor provides insanely fast performance. 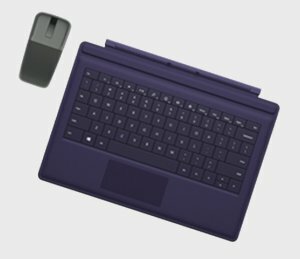 With the multi-position Kickstand, optional click-in keyboard,2 and multiple ports, Pro 3 gives you unmatched versatility as a tablet or laptop. 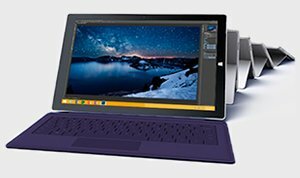 Since Surface Pro 3 runs Windows 8.1 Pro, you can install your favorite desktop software, including the full Microsoft Office Suite,3 and open apps side-by-side. 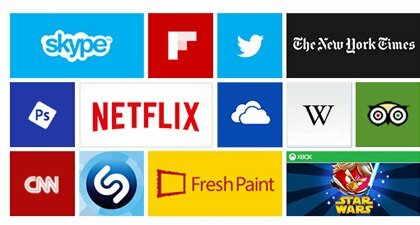 Get the best of Microsoft like Skype, OneDrive, Xbox Music and more, on one device. 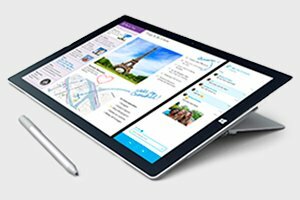 With a flexible Kickstand, Palm Block technology, and Surface Pen, Surface Pro 3 was designed to give you the most natural writing experience on a tablet. Click Pen once for OneNote, even if your screen is locked, to capture your thoughts instantly. Stay entertained with the bigger, beautiful 12″ Full HD screen, Kickstand, and Dolby-enhanced speakers. Easily expand your music or movie library and share between devices with the microSD card and USB port. With up to 9 hours of web browsing,4 our battery keeps going as long as it needs to. Testing consisted of full battery discharge while Internet browsing over Wi-Fi. Internet browsing was tested browsing 25 popular webpages. All settings were default except: Wi-Fi was associated with a network, auto-brightness disabled, and Bluetooth radio was turned off. Battery life varies with settings, usage, and other factors. All accessories are sold separately. 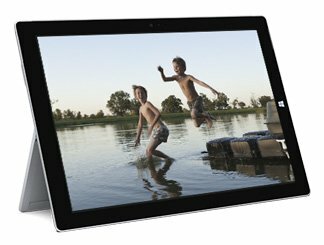 Surface Pro 3 is 11.9mm and 2.4lbs with Type Cover attached.